Detroit’s Movement festival certainly has no trouble living up to it’s name. Propelling myself through day two—after a night that ended well into the day—I was amazed to see how many people were right back at it, dancing under an unforgiving sun that had turned the temperature up a good eight degrees from the day before. It almost cracked ninety yesterday and the rave set was completely unfazed. Neither were the Martinez Brothers, whose punchy tech-house had the Beatport stage rammed with dancers for their late afternoon set. The brother team, aged 21 and 18, are a true breath of fresh air in the world of house music. Whereas many of their contemporaries are hitting their upper 30s and 40s in age, these two young guns are prim and ready to carry the torch. Ducking out from under the protective shade that surrounds the Beatport stage, I crossed Hart Plaza to catch one of the rare performances this weekend that didn’t revolve around the DJ. Shortly after 6pm, beloved Chicago emcee Kid Sister burst on to the stage with her usual combination of smiles, bravado and relentless enthusiasm. With a wonderfully schizophrenic visual backdrop, Kid Sis plowed through all her best material, even debuting two new songs. The first of the two taking on a classic, soulful Chicago house feel; the second was a hybrid dubstep-rap number that was met with unanimous praise. Anthony "Shake" Shakir keeps the underground stage rocking. He may not have been one of the “Big Three”—techno’s original guard of producers, Juan Atkins, Derrick May and Kevin Saunderson—but Anthony “Shake” Shakir is still one of the genre’s original innovators. 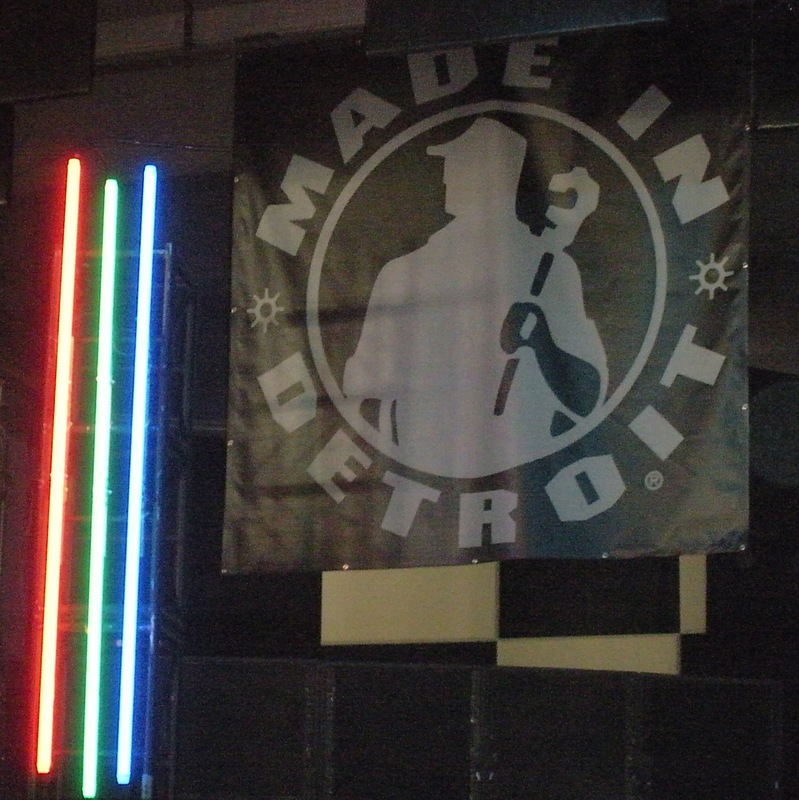 His set at the underground Made In Detroit stage was a case in point. The stage, which is in a concrete bunker just off of the main stage reminds of the scene in 8Mile when Eminem’s character hands it to his opponent in an underground MC battle. This stage is pure Detroit. Concrete, booming bass and an abundance of sweat-drenched funseekers. Shake met them with a mix of hard techno, disco classics and deep house, an exemplary set that displayed the varied influences that techno’s first wave was listening to while developing the genre. Mr. Scruff gets his potato men to dance up a storm for the packed crowd. Amidst the din of techno beats that dominated almost every stage, Red Bull’s stage was a welcome respite from the incessant 4/4 thump. Once the sun had gone down, Manchester’s Mr. Scruff took to the stage with his patented mix of Afrobeat, disco, soul and house. With each new song, his “potato men” drawings danced, wiggled and wobbled on the screen behind him. There were potato men chefs banging on pots, a potato man brass band and for his set finale, where he debuted a new song (that I can’t wait to get my hands on) there was even an army of dancing spiders. Having seen Scruff manipulate crowds overseas, it was insanely cool to see all these people dancing to dusty soul records in the middle of a techno festival. Ghostland Observatory definitely gave all the rolling masses their money's worth. Austin’s indie-electro madmen, Ghostland Observatory closed out the night. Detroit’s Inner City was on the main stage, but GO’s lasers, grimey dance beats and enigmatic frontman were too entertaining to break away. Between Aaron Behrens gyrating, screaming and dancing and the light show that tops just about any that I’ve seen, This side-stage headlining set may be the highlight of the festival so far. And while storm clouds are threatening to put a damper on the final day of dancing, we head out into the madness one last day to close out a pitch perfect Memorial Day weekend.